A Black Man. A Blue Baby. And a Miracle. Against the backdrop of segregation, Vivien Thomas, a black carpenter’s apprentice with a genius for surgery, and Dr. Alfred Blalock, a renowned white surgeon, dared to defy medical gospel by forging a partnership that changed the course of medical history. The two men’s work together led to one of the century’s major breakthroughs – a daring heart operation that has saved thousands of children afflicted with a congenital heart defect called “Blue Baby Syndrome.” With only a high school degree, Thomas became a cardiac pioneer and a teacher to two generations of America’s premiere heart surgeons at a time when he himself could not become one. His journey is a compelling, often overlooked American story of personal triumph over the strictures of his time. 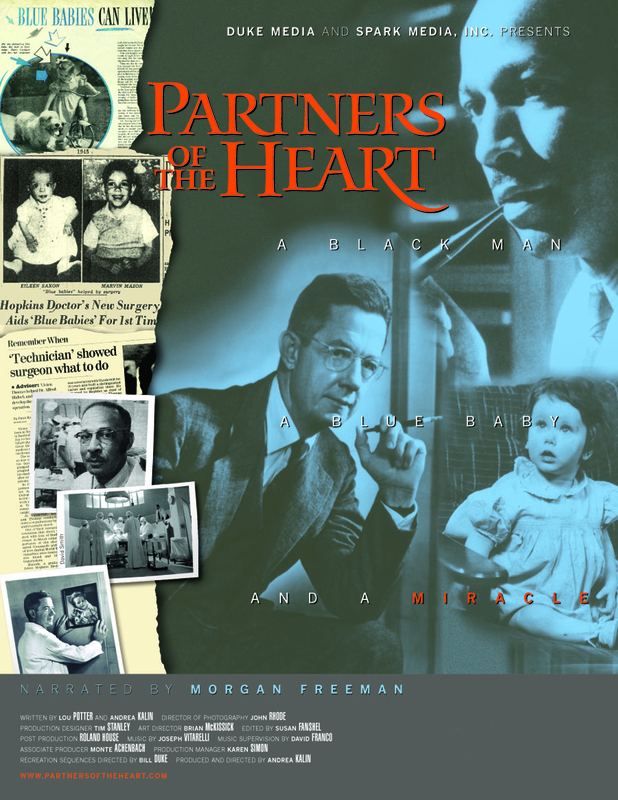 Narrated by Morgan Freeman, Partners of the Heart was funded by the National Endowment for the Humanities and was broadcast on PBS’ American Experience. In 2015, Partners of the Heart was highlighted as one of the top 50 projects funded by the National Endowment for the Humanities during their 50th anniversary celebration. Spark Media created an educational outreach campaign designed primarily to motivate and inspire minority and disadvantaged youth interested in science and medicine. A direct result of the campaign was the establishment of the CBCF Vivien Thomas Scholarship for Medical Science and Research, a $500,000 scholarship for African American high school graduates or college students interested in pursuing careers in health, medicine or biomedical research. GlaxoSmithKline partnered with the Congressional Black Caucus Spouses and the CBC Foundation to create the scholarship. Spark Media also arranged screenings for educational communities; the screenings were usually followed by a Q&A session to give students a forum for interaction and discussion. Screenings with high school students were held in Washington, D.C. (funded by the Annie E. Casey Foundation), Baltimore, Los Angeles, Detroit and Seattle. Another successful outreach strategy teamed up public programs in health and entertainment. GSK sponsored free health screenings around the country, focusing primarily on diseases that affect African Americans disproportionately, such as diabetes, hypertension, asthma, HIV/AIDS and benign prostatic hyperplasia. The public health screenings were always accompanied with a screening of Partners of the Heart. Another unique initiative involved organizing prominent physicians and community leaders to serve as “ambassadors” for the GSK Healthy Communities events, taking a role in mentoring in high schools, organizing health screenings, and promoting the scholarship program. Ambassador programs took place in Atlanta, Philadelphia and Washington, D.C.
As collateral material for the outreach campaign, Spark produced a CD of an interactive surgery game, “You Be The Surgeon,” where students can attempt to perform the blue baby operation, a promotional release of the Partners of the Heart film score, an educational viewer’s guide, which delves deeper into several of the film’s themes, as well as provides examples of contemporary inspirational stories and a re-edited 45-minute version of Partners of the Heart, making the film more accessible for high schools that wish to screen the program during class. J. Alex Haller, Jr., M.D. Geneological Society of Henry and Clayton Counties, Inc.
Cover, reproduced with permission from Modern Medicine, Vol.22, Issue 13 July 1, 1954. Modern Medicine, Copyright 2002 Advanstar Communications, Inc.